This book is an abridgement of Dr. Venema's highly acclaimed, major study, The Promise of the Future. Prepared especially with the non-specialist reader in mind, Christ and the Future expertly summarizes the Bible's teaching about the last things. 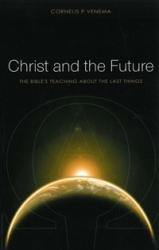 The Christ-centered nature of the biblical teaching on the future is the main emphasis throughout, as the author shows us the future of the individual, the church, and, indeed, the whole universe.